Professor Steve Wheeler, Associate Professor of Learning Technologies at the University of Plymouth, delivered one of the keynote addresses at the Inspire conference. Q1. What will you be speaking about at the Inspire conference in December? The title of my keynote is ‘Learning in the Digital Age: Theoretical Perspectives.‘ My key premise is that learning technology is just about everywhere in education. Universities are replete with lecture capture tools, interactive media, web based content and personal response technologies; students arrive equipped with social media and mobile devices; technology supported distance education has been long established; universities are experimenting with flipped classrooms, gaming and MOOCs. I plan to discuss our possible responses to this. What should we make it all, and do we consider these new trends threats or opportunities? How might we harness the powerful potential of these tools and technologies to engage students more, and enhance learning in higher education? What theories could be used to explain these phenomena, and how can social/psychological models better our understanding of how people learn when their communication, relationships and learning are mediated through technology? I plan to explore several of the older social science theories, and compare and contrast these with some of the newer, emerging theories to determine what they offer. Can the established theories still offer useful explanations of new practices and experiences, or can we gain some illumination for a better understanding of learning in the digital age from the newer theories? Q2. What issues in HE teaching and learning are you passionate about? My passion is learning – in all its possible forms. In fact, as a lecturer working in higher education, I consider myself to be a professional learner. I have gone on record as saying that although I don’t need to work any more, I continue to work at Plymouth University, mainly because it is a great place to learn and to continue developing my research interests around digital pedagogy. I will hopefully continue to work in higher education for as long as I’m interested. I will quit when I get bored, which at the moment isn’t that likely. I’m passionate about sharing knowledge. My maxim is: ‘Knowledge is like love. You can give it away as much as you like, because you still get to keep it.’ And it’s true – knowledge is not finite like money or resources. It’s limitless and should be available to anyone and everyone who needs it, and given away for free. Yes, education costs money. But ignorance is even more costly. It is the responsibility of governments to provide free education to its citizens. We enter a moral quagmire if we expect students to pay expensive tuition fees that will keep them in debt for most of their professional lives, and exclude many others who can’t afford the debt. Another equally disturbing issue for many scholars is the immoral and unethical business of academic publishing. The big four publishers – Elsevier, Wiley, Taylor and Francis and Springer – are making huge profits worldwide from the goodwill of academics. They publish publicly funded research which has been freely written, reviewed and edited by academics, and make huge profits from it. This doesn’t make sense. My belief is that if the content has been freely offered, and already funded by tax payers, it should be offered freely, or at the very least, at an affordable level to the academic community. The big four show no signs of relenting in their profiteering, so several years ago I took a very public decision to resign as editor of a major academic journal. I subsequently pledged that I would never again write, review or edit for a closed academic journal. I’m not the only one. This is a growing trend as was evidenced recently when the entire editorial team on one of Elsevier’s academic journal Lingua resigned over high price and lack of open access. The big four maintain a strangle-hold over universities, perpetuated by exercises such as the Research Excellence Framework review. And yet, the trust placed in high impact journals may turn out to be unfounded, especially when all the metrics are taken into consideration. How many people read an article in a closed journal? No-one knows for certain, but we know for sure how many access an article from an online journal. Many other academics are taking decisions similar to mine and turning their backs of closed academic publishing. This damning expose originally published in the Huffington Post reveals why the days of the academic publisher may be numbered. I still disseminate my own research widely, but now I do so through social media, blogs and open access journals. We have the technology. All of my content is licensed under Creative Commons, so that others who wish to, can freely use it, repurpose it, and redistribute it without cost. All they need to remember is to attribute my ideas to me, under the same CC licence. If all academics shared their research this way, knowledge would indeed be free, and everyone would benefit. Q3. As a lecturer how important do you think it is to look at teaching and learning issues through a disciplinary lens? I’m completely biased of course, but I believe that psychology is the perfect lens through which to understand and evaluate teaching and learning. Psychology is the science of human behaviour, and is the perfect discipline to apply as a foundation for all forms and levels of pedagogy. Psychology provides numerous theories to explain memory, perception, learning, social interaction, motivation – in fact just about any aspect of education. I firmly believe that without an understanding of psychology, teaching is diminished. How can we possibly hope to offer good pedagogy, and create inspirational learning environments if we don’t fully appreciate how the human mind works? We have a long was to go however, with many areas – undiscovered countries – such as how certain areas of the human brain function, why some students succeed while others fail, and so on, but we are getting there. The psychology of learning is a very exciting area of academic study. That’s why I’m a student of psychology. For me, it’s the best possible discipline to apply to my practice as I strive to become a better teacher and a more effective learner. Q4. What advice would you give to early career academics who want to develop their teaching and learning careers? Strive to be extraordinary and never give in. Be an inspiration to your students by showing a real passion and enthusiasm for your subject. Students won’t care how much you know or how many letters you have behind your name, but they will be impressed if you show a keen interest in their work and their progress. Go the extra mile. Seize every opportunity that presents itself. Be prepared to take risks. Connect and spend time with people who are innovative, and associate with those who are doing things differently, or in ways that surprise you. Learn from them as you develop your own professional identity. And remember – doctors save lives, but teachers make lives. This post originally appeared on Steve’s blog. 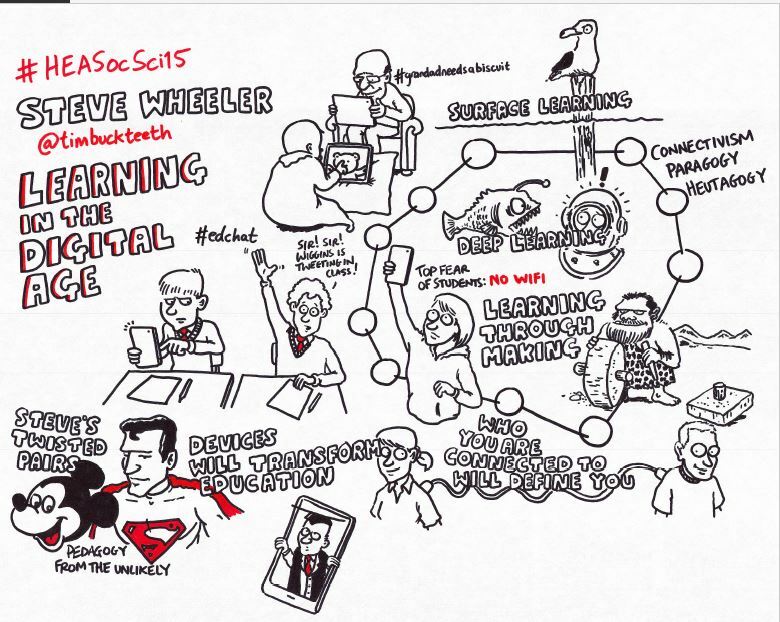 Inspire - teaching and learning in the Social Sciences by Professor Steve Wheeler is licensed under a Creative Commons Attribution 4.0 International License, except where otherwise noted.